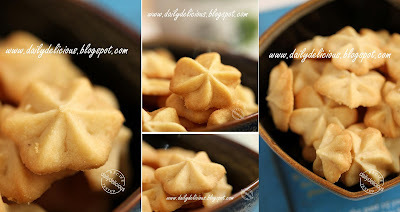 Butter cookies are great to have them around, put them in the box and place it anywhere that people can reach you will be surprised how fast they gone. Especially a small, and soft cookie. 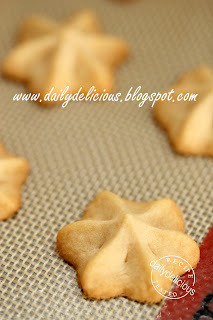 I don't think that we need any reason or occasion to bake some cookies ^^, they are the reason by themselves. There are many kinds of cookie, you can go for soft, crunchy, cake like or etc. actually I think that people always love it. 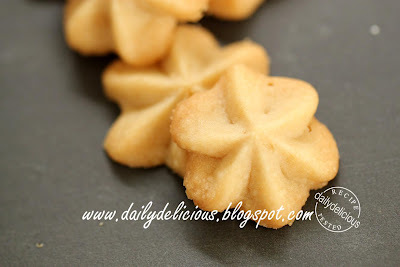 So, this time I really want to try this recipe, Maple Syrup Butter Cookies (from Biscuits by Australian Women's Weekly ) a small and compact book that I just got it last week ^^. Actually I bought it because I want to try the recipe for Jaffa jelly cookies, but I couldn't find the ingredient (instant orange jelly crystals) on my last trip to the supermarket, so I have to put my hand on other recipe instead, haha. I always love maple syrup and like the idea of using it in the cookie as a main source of sweetener, well I have a feeling that it's more healthy than white sugar^^ (I don't talk about the fact, hehe). And you can tell anyone that it doesn't contain sugar at all. 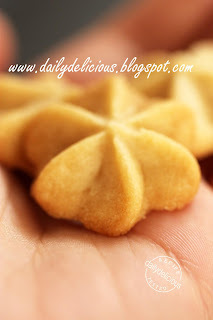 The fact is this cookie is sweet and buttery, from the look you might think that it's hard or crunchy, but it's soft and really melt in the mouth and the last thing that you will know is you will end up eating a lot of it just like me. Sift the flour and corn flour together, set aside. Line baking sheet with silicone baking mats or baking papers. 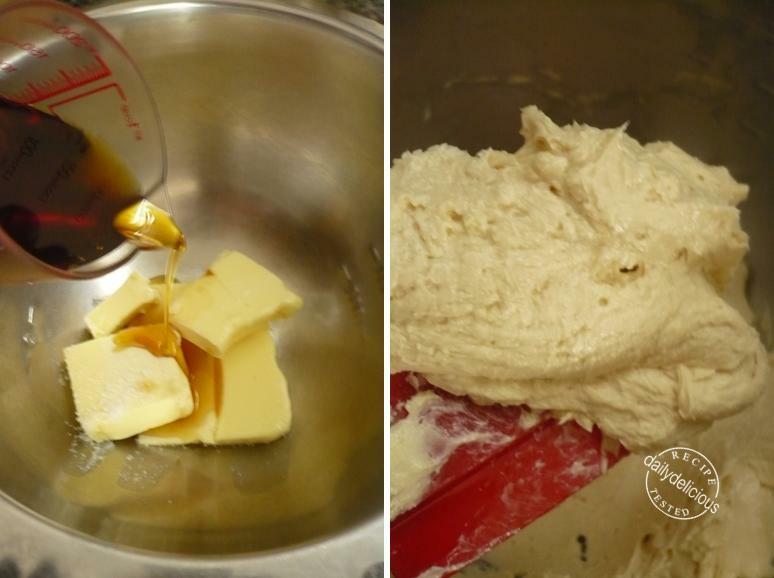 Beat butter, vanilla extract, salt and maple syrup in a small bowl with electronic mixer until light and fluffy. Spoon the mixture into piping bag fitted with 1cm fluted piping tip. Pipe stars about 3 cm apart onto prepared baking sheets. Bake for 13-15 minutes or until golden brown. ooh Pook, you can always make everything looks so beautiful. 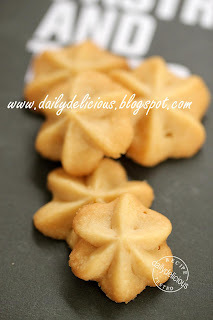 including this very simple butter cookies! awesome.. Thank you so much for another delicious recipe! The cookies are so tasty! Which grade of maple sirup did you use? I used grade C and they were very rich in flavour, but I might try them with grade A too (it´s hard to get other grades here). I use Grade A maple syrup, but I read that grade b is good for baking too. 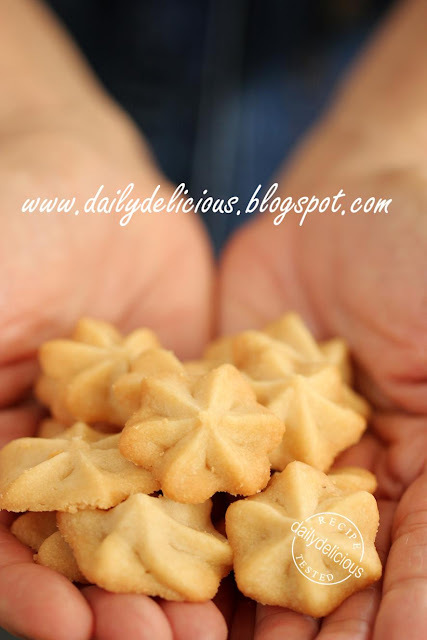 I have made these twice from the woman's weekly book and the cookies have always gone flat. I'm following the recipe and have no idea what is going wrong. Any tips? If it too flat, it can come from the gluten contain of your flour, you can use more flour, add about 10g or change 20g of plain flour into bread flour. Hi! 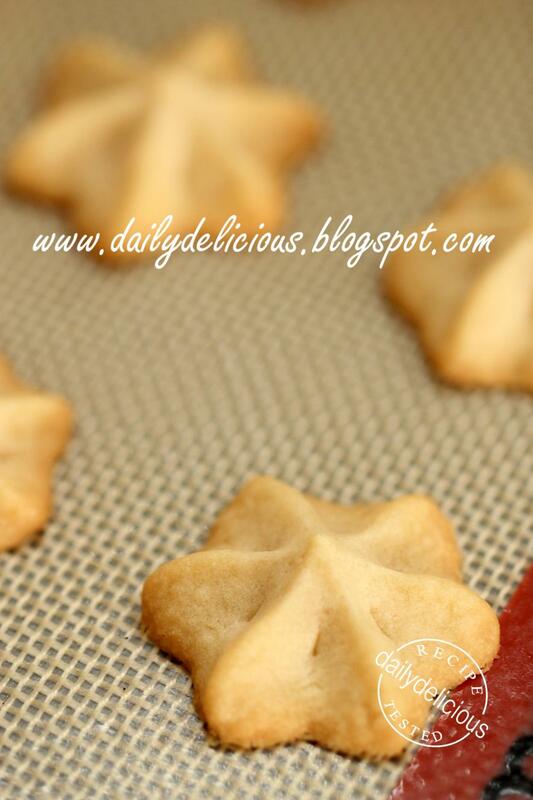 Do you think refrigerating them before baking might help the flat cookies problem? You can refrigerate the dough, it will help reduce spreading, but if it spread too much try adding 1-2 tbsp of flour will reduce the problem too. Hi, the cookies look so beautiful. May I know what piping you use? Hi there. . My cookies gone flat. Can I. Substitute cookies flour instead? 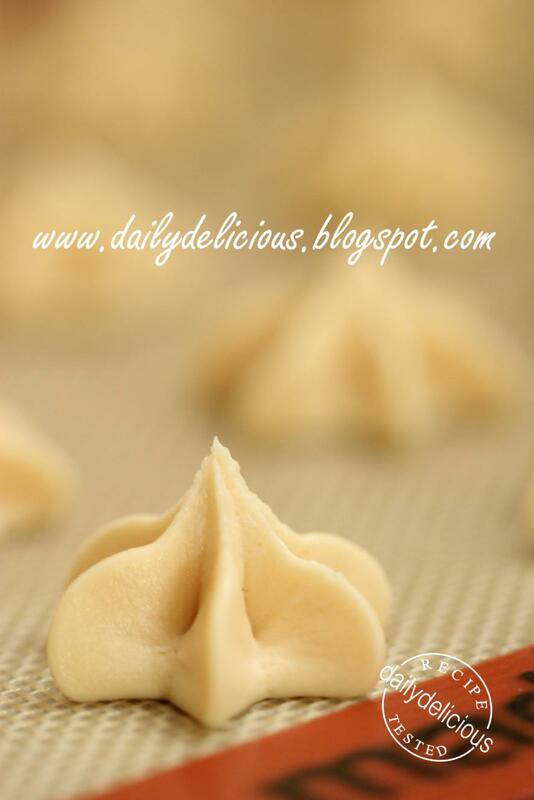 You can add 10-15g flour to make the dough firmer.